After searching the market for affordable VR glasses, I always ended up disappointed over the lack of quality. These Virtual reality glasses lacked in various features to compromise over the price. However, when I came across the Noon VR Pro, I was pleasantly surprised at how budget-friendly yet decent quality it was. With a sleek and modern design, it seemed to fit all my needs perfectly. Virtual reality goggles have changed the way we see the world. They have allowed humans to delve into far-off worlds, real or fake, and interact with its environment. With these glasses, you can play games, learn or explore places that seemed too far away. Mostly, there are two types of virtual reality goggles in the market. This includes mobile compatible and PC compatible goggles. Mobile compatible goggles are perfect for those who do not want to invest in a highly functioning PC. Furthermore, they do not require a dedicated space. You can use them sitting down or standing up. Navigation is either through a magnetic trigger or a separate hand controller. On the other hand, those who want a more immersive experience should go for the PC compatible goggles. They allow for a more interactive environment and make navigation easier. If you’re planning on gaming for hours on end, then you might need a pair that is comfortable. This can include comfortable padding as well as a lighter weight. The larger the field of view, the more realistic your virtual environment will seem. Go for at least 100 degrees FOV for a better view. Another factor to look for is compatibility. Your set might not be compatible with all phone sizes so, make sure that the one you buy is compatible with your phone size and OS. Next, decide what you might want to use it for. If you merely want to watch a couple of 3D videos, then a simple Google Cardboard will suffice. Or, if you want to play immersive games, then opt for a more expensive set. 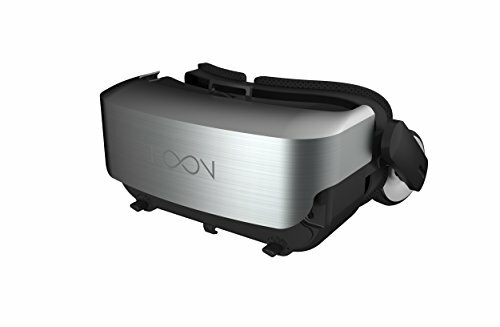 The Noon VR Pro is an ideal choice for anyone looking for an upgraded smartphone Virtual Reality goggles. It is the next step from entry-level VR. The Noon features a sleek and stylish metallic front that grants it a very modern look. It also includes a remote software that allows you to stream from your PC directly into your headset. Whether you want to watch 2D or 360-degree videos, the Noon converts them into cinematic masterpieces for your leisure. Lastly, it is compatible with all kinds of iOS and Android smartphones, given that their display size is about 4.7 to 5.7 inches. It offers a wide range of features right at your fingertips. The Noon goggles feature a metallic exterior which looks quite modern and sleek. However, the device is not only about the looks. In fact, it is as comfortable as it is stylish. It features a 3-strap harness design which fits over the head. This makes it easier to wear the goggles without them slipping off. Furthermore, the straps are adjustable so they provide you with the perfect fit. Otherwise, light may leak through the gaps and ruin your experience. Also included is thick imitation leather padding which is lined around all the edges. So, you can comfortably use them for hours on end without worrying about the edges digging into the skin. The leather is perforated which makes it more breathable so, you won’t have to worry about sweating too much. Moreover, the leather padding is connected with Velcro straps, so you can easily change it if you need to. The device comes with two different types of paddings to satisfy different kinds of users. What’s more is that the device is quite lightweight. It weighs merely 0.8 lbs so you need not worry about straining your neck or head. Even the stereo headphones are adjustable in length and tilt. The set features premium display quality that allows you to completely immerse yourself into the virtual world. The large lenses allow a large Field of view of about 101 degrees. This is quite sufficient for most videos. However, some users might not like that they can’t see the edges of the screen. This might be a small bump in the road, however, it might not be as noticeable if you’re not playing any games. The Noon goggles work with all kinds of smartphones if their display size is about 4.7 to 5.7 inches long. You can use your existing iOS or Android phone. The only requirements apart from the display size are the resolution and the gyro sensors. The resolution of your phone should be at least 1920 x 1080 for a completely immersive experience. In fact, you can watch videos at a resolution of about 11K. In addition, your phone should have gyro sensors, otherwise features such as Head tracking and tap UI might not work. Moreover, the glasses work with the Noon VR App which you can download from PlayStore. The app contains a library of videos and experiences that you can access. This can include 3D, 2D, and even 360-degree videos. The display quality can further be increased by using the focus dial. The dial is located on the set and helps sharpen the quality of the video. It mainly depends on how strong your eyesight is. The focus can be adjusted from -6.2 to +4 diopter. This means you might not need your glasses with the set. Even if your eyesight is very weak, you can still use the set on top of your regular glasses without feeling too uncomfortable. Apart from that, the set also includes height adjustment risers which help center your phone with the lenses. To help enhance your viewing experience, the set comes with anti-blue lenses. Blue light tends to be the major cause of eye fatigue and strain. These lenses effectively block the blue light, thus actively reducing eye fatigue. This allows you to watch videos for longer periods of time without worrying about hurting your eyes. Of course, I do recommend that you don’t use it for more than 20 minutes as the experience can often be overwhelming and disorienting. Headphones are included with the set to ensure the highest sound quality. These headphones are retractable so you can use them whenever you need to. It also helps avoid any unnecessary tangles and helps in better storage. Furthermore, you can adjust the length and the tilt of the headphones for a better experience. 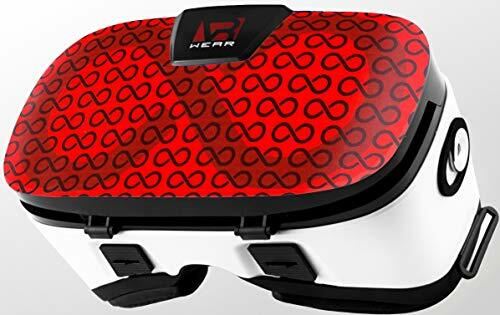 The headphones offer about 118 dB/mW sensitivity. The true-to-life audio supports a range of up to 20kHz for a more immersive experience. The stereo headphones make for a truly realistic experience as they create a surround sound effect. You can clearly hear sounds coming from your left and right side. A rather unique feature that I personally loved was the PC to VR streaming. All I had to do was connect the Noon VR Remote Desktop App with the smartphone and I could directly stream videos and game from my PC to the VR. This way you can also play virtual reality games with a joystick or a keypad. Another unique feature of the Noon VR Pro is the Wi-Fi connectivity. You can use the Wi-Fi to connect various devices together. The goggles can connect up to three devices that are using the same Wi-Fi network. This way all three devices can view and share the same videos. Also included is a capacitative touch button that allows you to control and navigate the virtual environment. Furthermore, it makes it more compatible with most 3rd party apps. This way you can access menus, pause or play videos and reset your viewing angles without removing your headset. In addition to this, the device features head tracking. So, you can control your viewing angle simply by turning or tilting your head. This is an imperative feature for 360 or stereoscopic videos. When I decided to buy the Noon VR Pro goggles, I first searched the internet for real-life reviews. Mostly, the response was quite positive. Most users loved the Noon VR App and the Remote Desktop App. This enabled them to stream a wide variety of videos from the app or their PC. Furthermore, most users found the audio and display quality to be quite high. They found the experience to be quite true to life. Another aspect most buyers loved was the comfort. They stated that these glasses were lightweight and did not strain their eyes even when they used it for long hours. 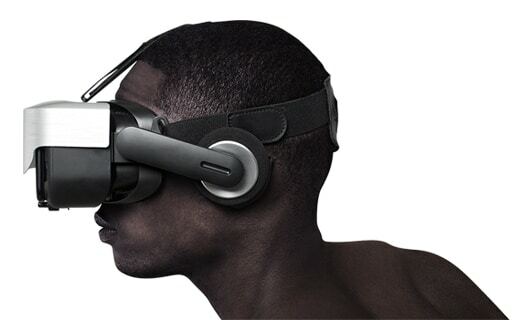 The VR Wear is compatible with more phones than the Noon, as it can fit about 4.5 – 6.3 inches. Also, the FOV is much more immersive being 105 degrees. Where the Noon features a tap control, the VR wear features a magnetic trigger to help you navigate or control. In addition, both the sets include leather padding, however, the VR Wear’s cannot be changed or replaced like the Noon. The VR wear does not feature any built-in audio either. On the other hand, it is also more expensive despite the lack of features. 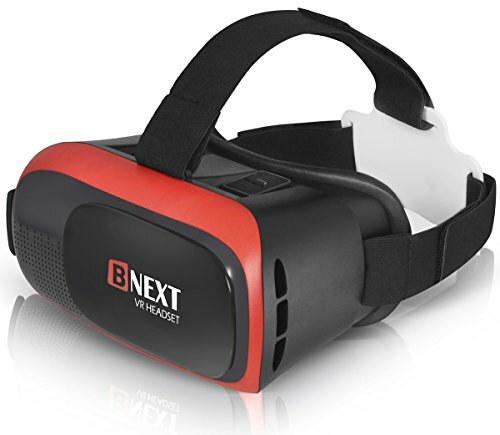 COMPATIBLE WITH POPULAR SMARTPHONES - Bnext VR Goggles compatible with apple ios iPhone X, XR, XS, 8, 8 plus, 7, 7 plus, 6, 6s, 6s plus, 6 plus, 6, 5 Samsung Galaxy s8, s7, j3, s7 edge, s6, s6 edge,o note5, a8+, note3, note 4, s5 ,one plus , Box and many more! The BNext can also fit more devices within the 4-6 inch than the Noon. It allows you to adjust IPD and lenses to allow for the perfect alignment. These are easy to use and setup. They have a larger field of view. The BNEXT is also more affordable than the Noon VR Pro. Moreover, the padding is purely foam padding instead of the Noon’s leather-like padding. This makes the padding much less durable. Also, the BNEXT features IPD and focus adjusters. 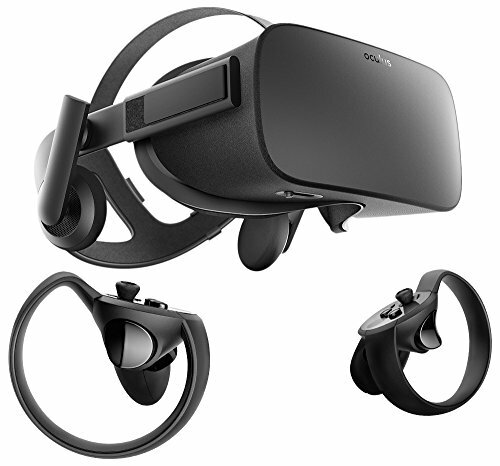 Oculus Rift Headset is compatible with PC and is a room-scale Virtual reality set. It features a larger field of view at 180 degrees making for a fully immersive experience. Furthermore, you can use it to watch videos and play games. It comes with Touch controllers that allow you to navigate and interact with the virtual environment in real time. It is, of course, much more expensive and requires dedicated space. What’s more is that it’s almost as comfortable as the Noon Pro with perforated leather padding and the three strap harness system. Furthermore, it also features built-in headphones. Overall, the Noon Pro VR is impressive, to say the least. Its Wi-Fi compatible features and an extensive video experience library truly make it unique in the Virtual world. You might not find many VR headsets that are under $50 and still deliver high-quality audio and video. This is perhaps why the Noon Pro is truly the exception. All you need is a compatible phone and you’re good to go. It is ideal for those who wish for a more cinematic experience at a budget! Check out the Noon Pro VR Headset here!